Dinner Under the Glow Comes to SilverRock December 14th. La Quinta, CA: The Greater Coachella Valley Chamber of Commerce is bringing one of their signature events to a new location, and the views could be stunning. The Chamber’s Annual Dinner Under The Glow offers a unique blend of fine dining and a hallmark of the desert’s skyline, hot air balloons. What makes the evening balloon glow different than other events in the valley is you get to ride them. 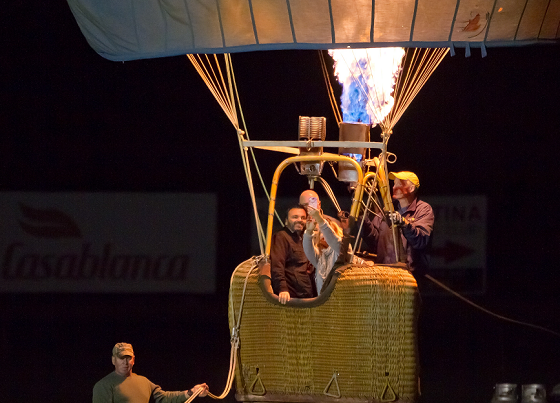 The unique experience originated at the Eldorado Polo Club in 2014, offering attendees a chance to enjoy a three-course fine dining experience under the warm glow of hot air balloons. “We place the dinner guests outside near the balloons” says Joshua Bonner, President and CEO of The Chamber. “The ambiance of being able to enjoy a dinner near these giant glowing balloons is really unique. Being able to then go up in them is icing on the cake.” The event grew to almost 400 attendees last year. Each attendee receives a meal prepared by the culinary team at SilverRock, which includes Prime Rib with a carving station, Chicken Piccata, Roasted Red Potatoes, Rice Pilaf, Fresh Vegetables and more. Guests will also be treated to the sounds of live jazz performed by Jason Weber. A veteran of the Southern California music scene, Weber has been playing the saxophone for over 30 years. Originally hailing from the Chicago area, Jason has 8 CDs under his belt. Guests are sure to enjoy his special appearance in our valley for this event. Event tickets are only $79 and are all inclusive, dinner and balloon ride. A cash bar will be available. Tickets for the event are on sell now at Eventbrite.